A Wild Idea is a documentary about the Yasuní-ITT Initiative, Ecuador’s unprecedented proposal for fighting global climate change: In exchange for payments from the world community, the country will leave untouched its largest oil reserves. 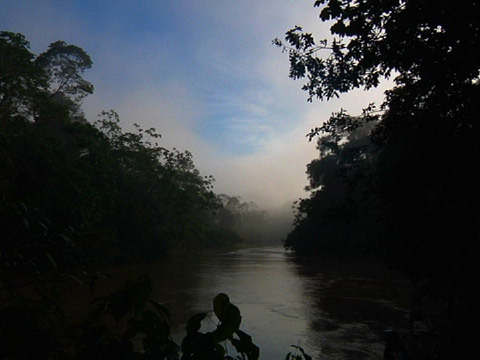 The film takes the viewer to the Ecuadorian Amazon, capturing the rain forest’s stunning biodiversity. The film also focuses in the millions of barrels of oil lying beneath a place known as the ITT Block. Exploiting the ITT seemed to be the logical step Ecuador had to take, but political changes have affected the way the country views oil development. Through testimony representing different perspectives and rich archival video, A Wild Idea shows how the seemingly utopian ideal of keeping valuable oil underground turned into an official proposal. A Wild Idea is a thought-provoking film that explores the complexity of oil development within a fragile ecosystem, its local and global implications, and its effects on the planet as a whole. Verónica Moscoso Cordero is a storyteller who narrates through radio, video, photos, multimedia, articles, chronicles, short stories and documentaries. In the late 80s, she studied social communication and specialized in television. In Ecuador, her first job in media was at a newspaper, then a TV station and finally advertising. In the late 90s, Verónica decided to see the world, and traveled for a year backpacking through Israel, Egypt and Greece. Then Malaysia, Thailand and Singapore. In 1999 she moved to the San Francisco Bay Area, where she currently resides. She published her first book, Historias con sabor a sueño (Dream Flavored Stories), a compilation of five fantasy stories, in Ecuador in 2001. In 2002 she became involved in community radio and became a producer and a mentor. Her second book, Los ojos de Carmen (The Eyes of Carmen), a short novella for Spanish learners, was published in Berkeley. This book has been translated into French and English. In 2011 she completed a master’s degree at the UC Berkeley Graduate School of Journalism.